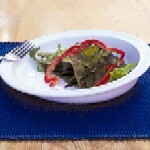 Using your fork, or spoon, you ""push"" your food against the high back wall of the plate and onto your cutlery. The entry side is low for ease of use. 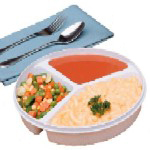 Three compartments in the Partitioned Scoop Plate keep food separated. The two smaller sections hold up to 6.75oz. while the larger one has a 12.6 oz. 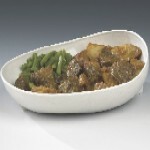 The high walls of each compartment can be used to help you place food onto your spoon or fork.